Still not sure about Hot Kratos. Maybe I am out of the loop but "Hot Kratos"? Ryu (StreetFighter) grew a beard and was dubbed "Hot Ryu" Possibly the same idea here? I don't get it myself- but the internet will do it's thing. Wouldn't Popa Kratos be more accurate? That’s not what was said. Randy simply said that wasn’t the NECA version. We’ve known about the 7” figure since SDCC. Last edited by Joe Moore; 01-03-2018 at 07:13 PM..
Color me impressed. I forgot that it came with more Thsn an axe so the accessory count is a very pleasant surprise indeed. I was already going to nab him, but now I have no choice but to buy him on sight. I also see a good opportunity for NECA to produce a Father-Son 2 pack with a fully articulated version of Kratos's son Atrius packed along with a screaming bearded variant of the god of war himself. 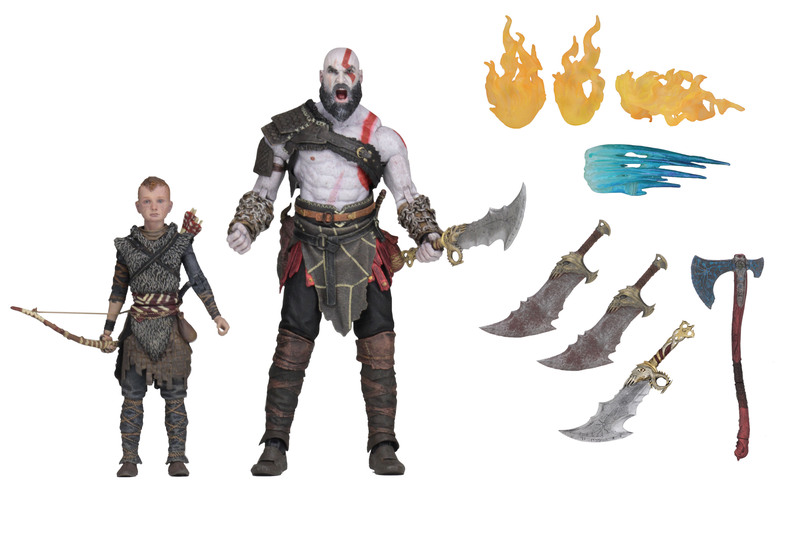 Kratos would come with all of the weapons in the single carded release along with maybe a new exclusive weapon while Atrius gets his dagger, bow, plenty of arrows and a quiver along with that awesome NECA detail. But first they would have to go through the trouble of sculpting a brand new figure... Thoughts? Last edited by AlanThCollector; 01-04-2018 at 07:18 AM..
Aesthetically speaking, at least in my opinion, I think the figure looks better without a cut for ab-crunch articulation. My guess is that he either has a soft overlay chest piece with ab-crunch articulation underneath, like NECA's Nathan Drake and 7in Reeve Superman figures or that he is has a ball jointed waist that has a forgivable range of motion similar to what an ab-crunch might provide. He's got 36 points of articulation and in my mind I counted all the obvious spots and came up short with only 32 so he could very well have that soft overlay chest I was referring to. This. All day long. Every day. I am excited about this figure. It looks great. If they managed to cover up the ab crunch then it will be a pleasant surprise. It does look better without the ab crunch break. I JUST NOTICED THE SHIELD! this guy is going on preorder immediately. Can we get that boat in an ultimate release? Last edited by Bearjew; 01-04-2018 at 08:58 AM..
Earth 2 Ryu and this Kratos looks like something from Mad Max. Whatevs, enjoy if y'all enjoy to each his own. Speaking of Mad Max, yes we do need some proper Mad Max figures. Oh I'm all over this. 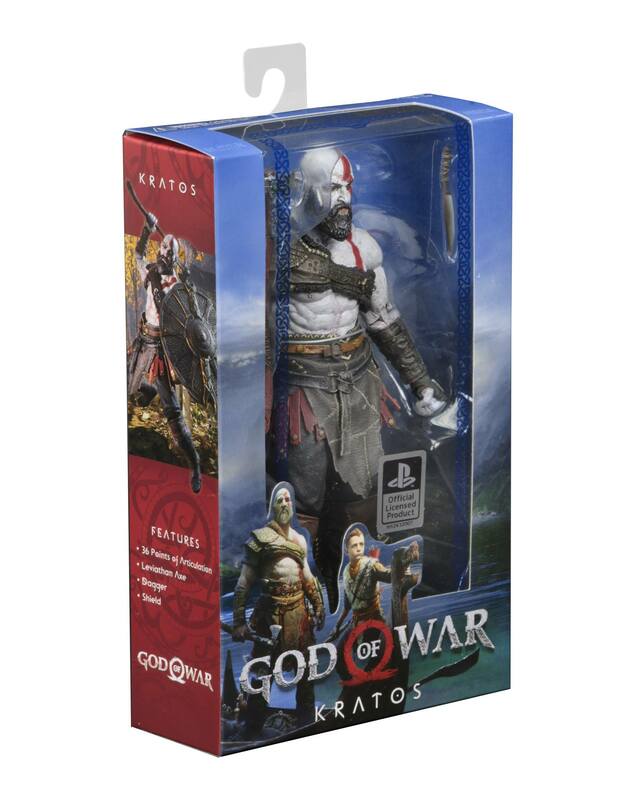 I've already got Kratos but this new head and weapons, and "Boy", need this. Dammit, I thought I could resist the urge to want this but seeing these new images I can't hold the feelings back. This Kratos can easily be displayed separately with the blades of chaos in a battle pose while I set up Atreus next to my regular Old Man Kratos with his Leviathan Axe. Man I totally called this about 6 months back! I'm so glad they are making this a reality. The weapon effects really help elevate this set! Despite the droubt NECA had for a few months with new products, they sure came back in full force for SDCC! Last edited by AlanThCollector; 07-20-2018 at 04:02 PM.. This is awesome. Fingers crossed we get the other gods. Freya, Baldur, Magni and Modi. Also the dwarven brothers. A full god of war style norse pantheon in 7 inch scale would be awesome. 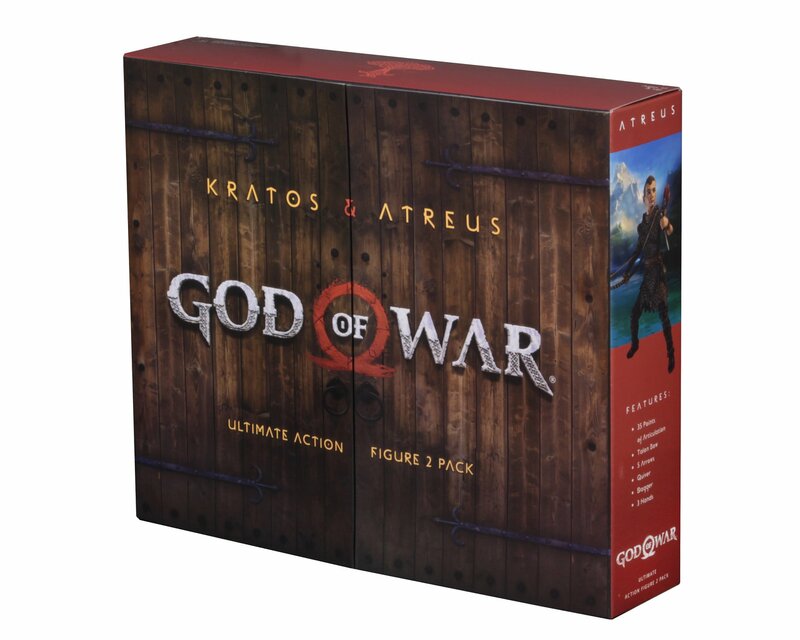 This looks awesome and I love Atreus, but I hope they include an extra open/weapon grip right hand for Kratos or adding the blades of chaos are kinda pointless . . .
Wow! Talk about bang for your buck! The final product looks amazing and is jam packed with everything you could imagine. This is an "Ultimate" set that's worth every penny. The effects pieces have so many display possibilities outside of this set and the chains on the Blades of Chaos are an excellent touch. I wish all of NECA's "Ultimate" figures could be this great. Well, dang. This is just about everything you could reasonably ask for. Now give me Baldur with suplex action.